Looking for a USED SPEEDMASTER SX 74? Performance innovations in conjunction with the assurance of a winning machine platform: The Speedmaster SX 74 combines the innovative and future-oriented technology of the XL range with the successful Speedmaster SM 74 platform. You benefit from the greater efficiency and cost-effectiveness that result from shorter makeready and throughput times and ergonomic operation of the machine. Highly versatile and performing with profitability across the board - the Speedmaster SX 74 is the new benchmark in the 50 x 70 format range. The technology concept of the Speedmaster SX 74 with comprehensive automation is the pioneering response to ever increasing market requirements with regard to quality, versatility, and price. This machine gives print shops the decisive competitive edge that allows them to react optimally to all kinds of customer needs. The Speedmaster SX 74 configuration and equipment can be individually customized. This ranges from two to ten printing units, optionally with perfecting device or coating unit. The successful Speedmaster perfecting device from Heidelberg delivers consistent high print quality on both sides of the sheet. Depending on the relevant requirements, the Speedmaster SX 74 can be equipped with a number of components - such as AutoPlate Pro, inking unit temperature control, or Prinect Auto Register. The result is a made-to-measure machine that paves the way for profitable production. As a pioneer for eco-friendly printing Heidelberg develops solutions to reduce CO 2 and process emissions as well as waste and to eliminate it. Consequently, the technology of the Speedmaster SX 74 sets standards in more than just productivity. The high energy efficiency and the careful use of resources make it the most eco-friendly machine in its class. The Star System peripherals are perfectly coordinated with the press. They are highly efficient and designed to conserve energy and resources. Reducing or completely eliminating the use of alcohol by equipping the press with special rollers in the dampening system and recommended peripherals makes another important contribution to ensuring environmentally friendly print production. This results in a print process that delivers eco-friendly operation at lower costs. 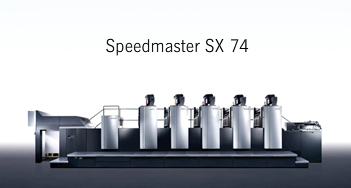 Looking to Purchase a New HEIDELBERG SPEEDMASTER SX 74?